While I still had the jar stamp and die sets on my desk I printed off a few more penguin images from the download and coloured them with pencils. 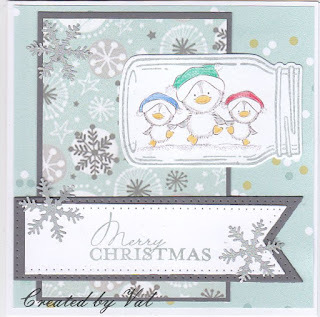 The penguins were resized so that once coloured I could stamp the jar around them before die cutting the shape. The sentiment was stamped onto white card and cut out with banner dies and some seasonal paper was used to make up the card. A few silver snowflakes were punched and added for extra interest. I saw this pop up on my dashboard and you made me smile. I was working on a huge wedding last week and am only just catching up in blogland .. .. AGAIN!! Love how you managed to get all three penguins in the jar.